After attending the GNYMLA Spring meeting at Lincoln Center this morning, and doing some errands in the area, it was time for lunch. Since I had to head downtown for another errand after lunch, Turnstyles in the 59th St. Subway seemed like a good bet. Turnstyles has really grown in size during the 8-plus months it’s been open, including about 39 different shops, eateries 🙂 and hangouts. 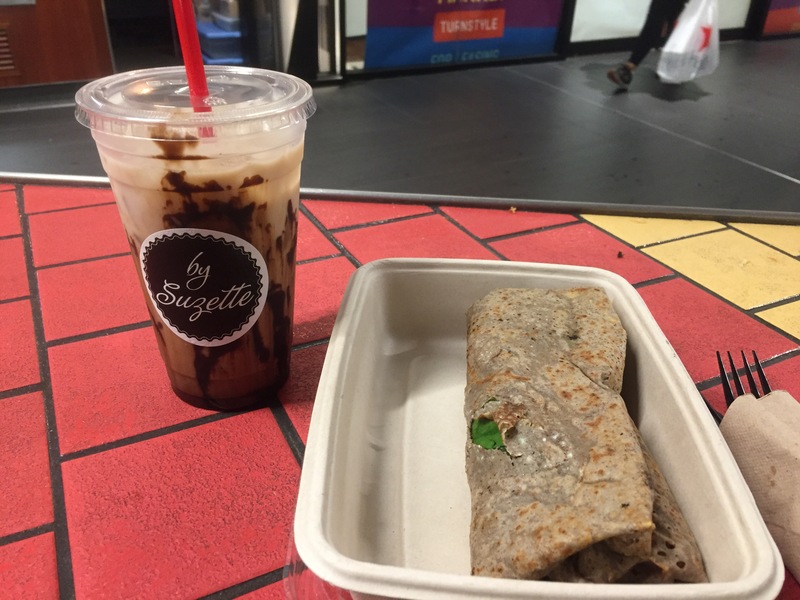 I saw several promising places to eat; today I chose By Suzette, a friendly crepe place. They have many varieties of savory and sweet crepes, but I “made my own”, sort to speak: buckwheat crepe with scrambled egg (instead of cheese), smoked salmon, spinach, mushrooms (what? No mushrooms? No!! ), tomatoes and pesto sauce. It was excellent, very filling and delicious. It made my day. I was stunned. That sounded wonderful, and was exactly what I wanted and needed. “Can I get it iced?” I asked. She nodded. It was the best iced mocha drink I ever tasted. Let it rain hard outside; I need to stop and savor this for a while. Happy Cinco de Mayo everyone! And enjoy your weekend!